In his book, Disrupting Class, Clayton Christensen and his co-authors identify four objectives that U.S. society has asked of public education. Each one is incremental; that is, each adds new expectations while still retaining the previous objectives. This latest goal is both transformative and controversial. There's little doubt that society is looking to our educational programs to relieve poverty. But many educators are skeptical about their ability or responsibility to address the poverty problem. Regardless, schools are no longer judged exclusively by their top achievers or even average scores. Frequently, the focus is on the bottom performers -- often at the expense of average or high-achieving students. 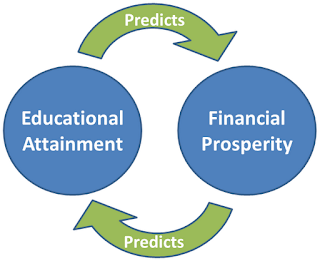 Educational attainment predicts financial prosperity. Financial prosperity of parents predicts children's educational attainment. The most important predictor of educational attainment is the educational attainment of the parents. When a school fully embraces the "Eliminate Poverty" goal it must accept responsibility for student motivation. Previously schools were expected to offer opportunity. If a student didn't take advantage of that opportunity it was their problem -- or the family's. Now, schools must motivate students to achieve, not just give them the opportunity. The trouble is, schools don't know a lot about motivation. Dan Pink has been studying what motivates us. There's a body of research into motivation that goes back to the 1960s and earlier. But organizations have been slow to apply this knowledge because it's counter-cultural. It turns out that carrot and stick type motivators like financial incentives, fines, privileges and so forth are effective for repetitive, mechanical type work. But when it comes to cognitively demanding tasks, bigger incentives actually impair performance. As long as the task involved only mechanical skill, bonuses worked as they would be expected: the higher the pay, the better the performance. But, once the task called for ‘even rudimentary cognitive skill,’ a larger reward led to poorer performance. This has all kinds of implications. For example, in order to place greater emphasis on student achievement, states and districts are considering merit-based pay systems for teachers. But teaching and learning are cognitively demanding activities so merit pay is unlikely to be a functional motivator. Meanwhile teachers are complaining about reduced freedom in the classroom -- a loss of autonomy. But, the subject of this post is student motivation. Since the advent of the Carnegie Unit, students have received academic credit for seat time. Keeping students in seats is a mechanical task so schools and vice principals are compensated according to attendance rates. We even have truancy laws that require that children spend a certain number of hours in school and punish them when they don't comply. As with teachers, we're using traditional incentives to motivate a mechanical task -- simply being present. Automony: In studies of whether changing instruction to match learning styles helps students learn better, researchers find that simply offering students a choice of activities resulted in better performance. This makes intuitive sense because when students choose their own activities, they're invested in the outcome and should perform better regardless of whether the activity is a better match to an individual's learning style. Mastery: Khan Academy includes a learning map that graphically displays the topics that students have mastered and their progress toward achievement goals. It grants badges for particularly important achievements. Purpose: How often do parents and teachers hear the question, "Why do I have to learn this?" Lack of purpose is a strong demotivator. Educurious encourages authentic learning by posing real problems to the students and connecting them with real-world experts. We have more than 50 years of research indicating that motivations are much more complex than carrots and sticks. Yet we keep resorting to these familiar tools despite their ineffectiveness against cognitively-demanding tasks. As schools take greater responsibility achievement, not just opportunity, it will be important to apply the right motivators. When Will Education Productivity Improve?